build your artistic skills, learn something new and have some fun. Lower level meeting room 7:00 to 9:00 p.m.
You may attend up to 3 meetings FREE prior joining the club. please click the "Events Calendar" button. Do you have an event you would like to see included in our Events Calendar? Are you a presenter that we might consider having as a guest? in the new Gallery at City Hall - open whenever the building is open. 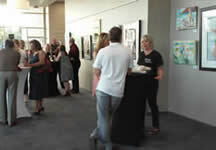 Westland's Gallery At City Hall is host to many exhibitions. Three Cities Art Club members enjoy creating a fused glass piece during workshop hosted by member Sharon Lee Dillenbeck's D&M Art Studio.